A2SR is a leading indicator, has special technique in determining the levels of Support (demand) and Resistance (supply). Leading indicator is prepare all actual SR levels before price reach there. Unlike the ordinary way that we seen on the net, A2SR has a original concept for determining SR levels. A2SR will auto select the SR level according to your trading style. Even though you are changing the time frame but the SR level will remain on its position. Because the actual SR is not obtained from the time frame you use. A2SR has complete instruments for trading needs. Current Trend today, including a suggestion for placing positions. Auto level trend lines for SR, Breakout and Breakdown. Daily price jump and fall in average and maximum range (news events). Average and maximum price jump/fall at time frame H4 (news events). Overbought and Oversold, displayed at the same time for scale H1, H4, Daily, Weekly and Monthly. B. Why we prefer to use A2SR? SR levels here are an actual level, and not obtained from the time frame as usual. It is leading indicator, the SR levels are available before price reach there, and it is not repaint and not lagging either. 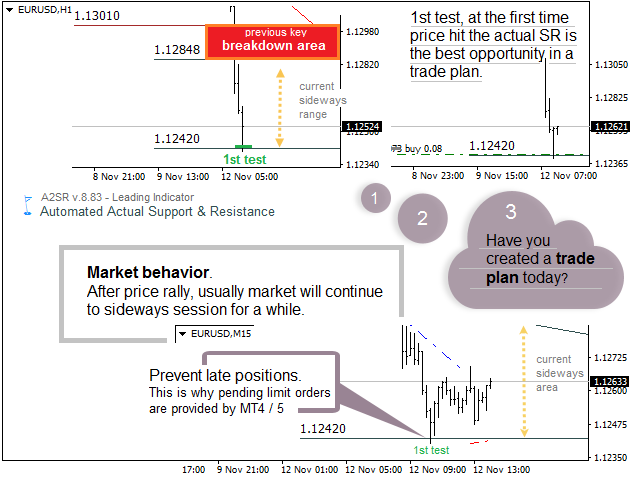 A2SR have been designed for creating trade plan for any currency pairs, metals, stocks, and for all symbol in MetaTrader 4. Basics of using A2SR are also available in user's guide in .pdf file, and you will get further training from the author as necessary. Usually, people could run A2SR properly within few days only, because it is user friendly after you read the user's guide document. You will no longer need in busy drawing on the chart, because A2SR help you to work automatically and all instruments are completed. A2SR will help you to select which SR for Short-Term or Swing trades. Finally, you will have plenty of time to review the market, including market sentiment and creating trades plan. C. Basic guide for A2SR usage. SR is a line level that displays a price. Levels above current price is Resistance. Levels below current price is Support. C.1. Short-term or scalp trades: non news. C.2. Short-term trades: news event. C.3. Swing, trades only at strong SR.
C.6. 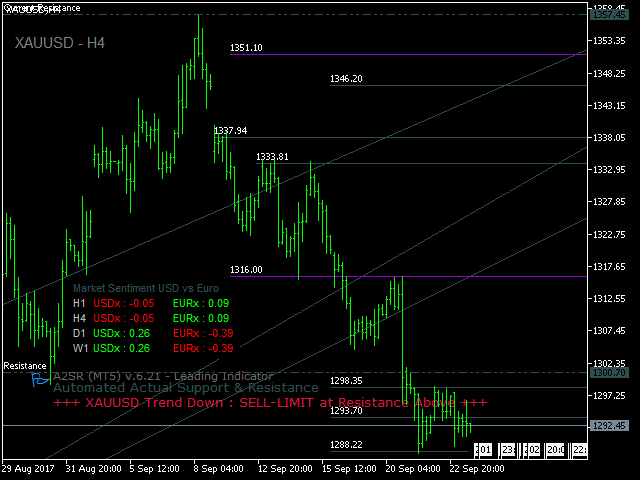 Trade on OB/OS H4, Daily, Weekly and Monthly. C.7. 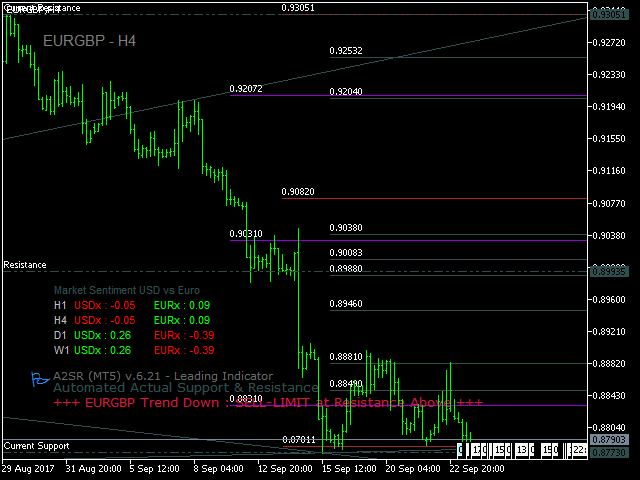 Trade on a combination of the conditions described above. Suffix Currency Pair - If your currency pair has a suffix, e.g EURUSDm, enter with m. Leave it blank if your pair currency has no suffix. Default is blank. SR Style - Enter 1 for Swing, 2 or else for Short-Term. Default is 2. Display Actual SR - Display actual SR according to trading style Short-term or Swing. Default is true. Color level 1 - Default is clrDarkSlateGray. Color level 2 - Default is clrDarkViolet. Color level 3 - Default is clrBrown. Display Trend - Show you trend today and suggestion for placing position. Default is true. Display Jump/Fall (H4, Daily, Weekly) - Default is true. Color H4 Jump/Fall - Default is clrFireBrick. Color Daily Jump/Fall - Default is clrForestGreen. Color Weekly Moves - Default is clrBlue. Display OB/OS - Default is true. 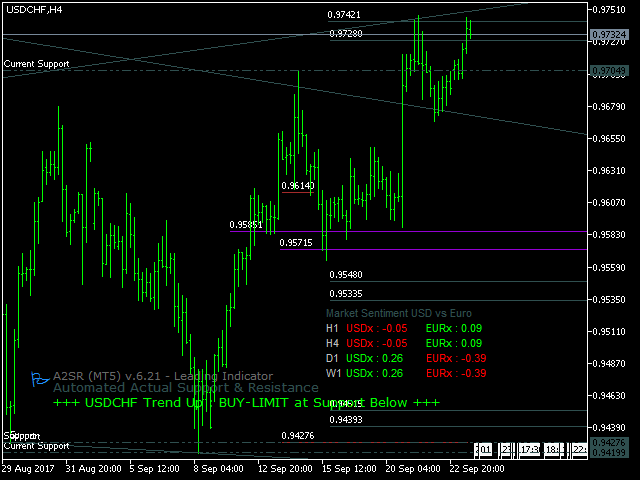 Display trendline SR and Break - Default is true. Color Trendline - Default is clrDarkSlateGray. Display Early Sign Breakout/down - Default is true. Display text early sign break - Default is false. Color D.S/R - Default is clrTeal. Color W.S/R - Default is clrChocolate. Display USD/EUR Index - Default is true. Margin left for IDX position - Default is 600 px. Margin bottom for IDX position - Default is 75 px. This product is nothing special. Overhyped price. The seller is making it like if there are secrect levels and currecy strenght. I have tested it and there are bugs which I wrote the seller to fix and they are still not fixed its almost 6 months. There are no alerts as such. Comparing to MT4 version this is far behind. I think I have to give honest review. If you are a coder then alerts as such are couple of hours job. A normal Support and Resistance indicator is far better. This indicator just got released on MT5. I was waiting for it and sure enough it is just amazing. The indicator is simply awesome. I cannot stress that enough. Almost magical. The cherry on top is the author. He went out of his way to help. On matters that did not even involve the indicator. I am extremely grateful for all the assistance. THIS INDICATOR IS HIGHLY RECOMMENDED. 1. Display Strong Breakout/Breakdown level. User can use candlestick chart despite A2SR prefer to use bar chart. - Style Swing or Short-term can be selected easily. Daily price jump/fall in average and maximum. By this way, we can choose which Actual SR that nearest with Jump/Fall level is projected to start price correction, and also for use as the limits of price movements at the time of news, and central banks speech.